The Sea-View apartments started operating on 1996 at the second floor of a four-floor building, at an ideal location in the center of the town of Rethymno and exactly opposite the wonderful sandy beach of Rethymno. We have four studios and two apartments: Each of the studios is for two persons, one apartment can accommodate three persons and one 2-bedroom apartment can accommodate four persons. All of the studios and apartments have balconies. 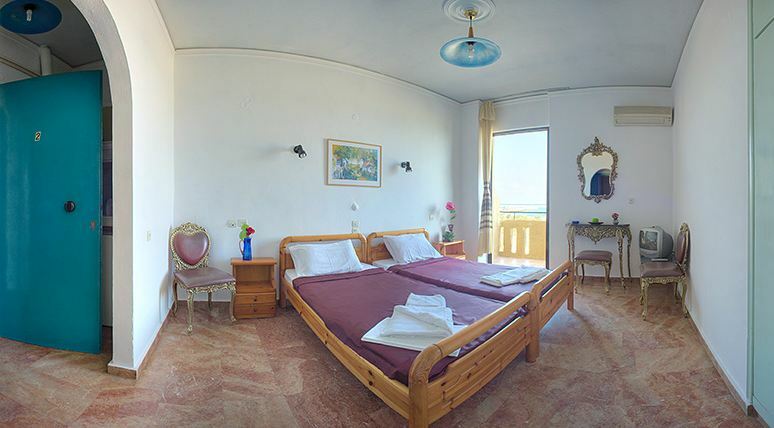 The studios are in the front side of the building from the side of the sea with direct panoramic view to the beach and the Venetian castle and the apartments are at the back side of the building, looking to an alley. There is no breakfast offered. All of the studios and apartments have cooking facilities. The Sea-View apartments runs under the license of the Greek National Tourism Organisation (G.N.T.O. ), officially classified as class A. Our hotel stays open all year round. bookings for organized bus tours to the major places of interest in Crete, cruises to Santorini island, scuba diving, horse riding and trekking. You can park your car at streets next to the apartments, free of charge.